Body Shape Pilates is run by Nina Ingham a CYQ Level 3 Pilates Instructor at the new purpose built Pilates Studio located on St. Clements Road, Parkstone, Poole. Nina is a trained and qualified practitioner offering a range of pilates classes in the Poole and Bournemouth area including pilates for beginners, pilates in pregnancy and pilates exercises for improvers. The pilates workout is suitable for all ages and abilities with focus on delivering a series of exercises that work the muscles to target the deep postural muscles. Body Shape Pilates run sessions throughout the week at the Pilates Studio in Parkstone near Poole. 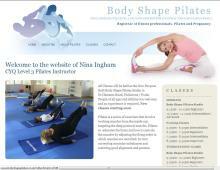 Contact Nina Ingham, Pilates Instructor, for more information on the pilates classes in Poole.